We love Brio. Adore it. However, we have lots of track and not much for our little Brio people to do other than ride about on the rails all day. So far we have the best Brio railway starter kits but our little Brioians [that’s what we’re calling the little Brio people] want some excitement in their lives – some drama! The Brio Central Fire Station and Rescue Helicopter gave them just that. When the Brio Central Fire Station and Rescue Helicopter arrived I’m not sure who was more excited. You see, it was like the meeting of most of the boys’ loves in life. At last we had a way of recreating Fireman Sam episodes, with trains AND a helicopter to boot. We’ll say it’s Tom Thomas’s. You see, Hero’s big love is helicopters. He points them out in the sky and I think helicopter [heh-rh-coptuh] might have been one of his first big words. There’s something about them – and he can generally tell the difference between the noise of a plane and ‘copter when they fly overhead. Anyhow, it was pretty obvious as soon as the two boxes arrived which one Hero was going to go for, and the bigger boys started assembly on the Fire Station. Hero hugged his helicopter and shouted excitedly whilst the other two tried to convince him to hand it over. No dice, big brothers. That there are are batteries required – and batteries included. How amazing Brio wood is. We’ve accidentally left some track outside overnight whilst it’s rained and no swelling has occurred, despite the mister declaring the train set ruined when we discovered it. It’s fantastic quality. Not just buying more track. This set comes with a joining piece of track only and so you’re not investing your money in track that you don’t need. The simplicity of the design of the fire station. A slide, and an open station for little people to be moved about in. The siren and lights on the fire engines and the little hose. Adorable details that little hands love to explore. That we can also fit little Lego men in both the Brio Central Fire Station and Rescue Helicopter perfectly for even more characters to join in! That the fire station had a lift. When I was little, the most joy I had in buildings for little toys was the lift. I know Fire Stations don’t have lifts, but Brio is so brilliant that it’s hard to think of ways to improve. That there was a little bell in the fire station to ring. Saying that, there’s a wish I might regret after a while. 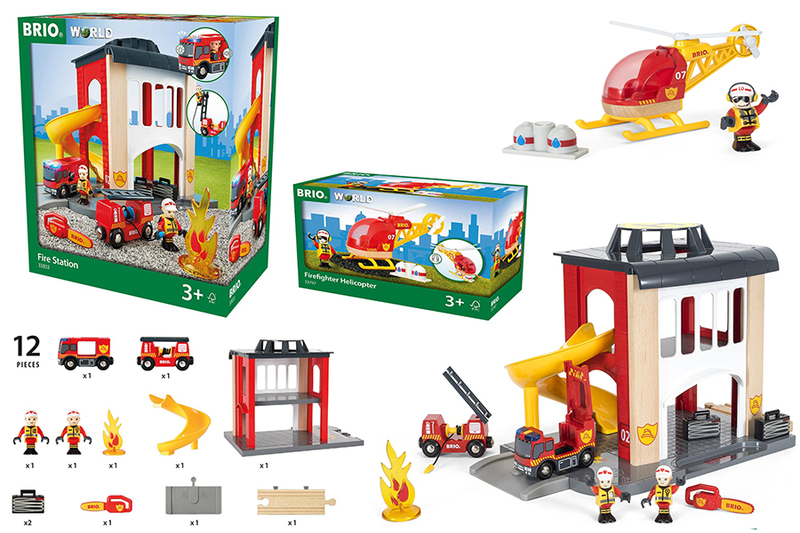 We were sent our Brio Central Fire Station and Rescue Helicopter for the purposes of this honest review.